It doesn’t get any more textbook than this – a group of people at a creepy place gets killed one by one until the “final girl” a.k.a. “white virgin” is left to face the antagonist and escape. Most generic Hollywood horror flicks use this same formula over and over again and although it has been poked fun by being the successful 2012 comedy horror film The Cabin in the Woods, somehow that formula still works to cash in from the general audience today. 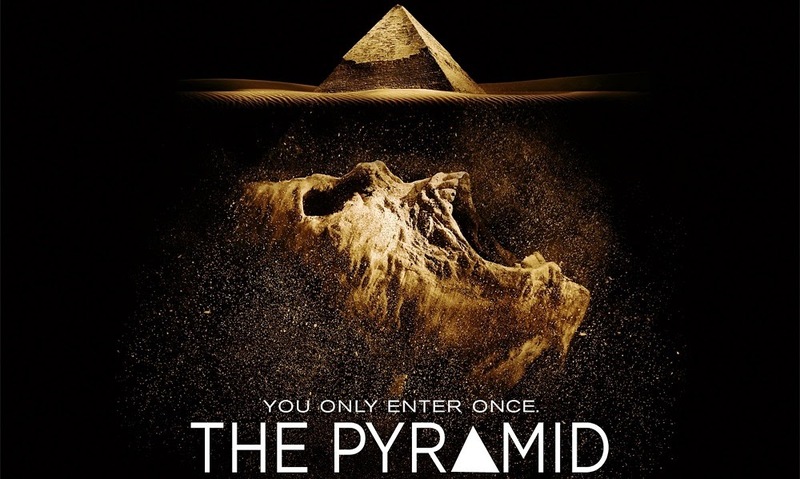 Some of these horror flicks are thrillingly entertaining enough despite the typicalities, while others are just thoroughly rubbish, and disappointingly, The Pyramid is the latter. The story takes place in Egypt where a team of archaeologists uncovered the first ever three-sided pyramid that’s buried in the desert for over 5,000 years. Due to the growing political protests nearby, they are ordered to evacuate the expedition immediately, but of course, they aren’t leaving without having a “quick look” inside of their big discovery first. They send a remote robotic rover in to check out the place but loses signal in a matter of minutes. Despite the very obvious red flags and his initial disapproval, Dr. 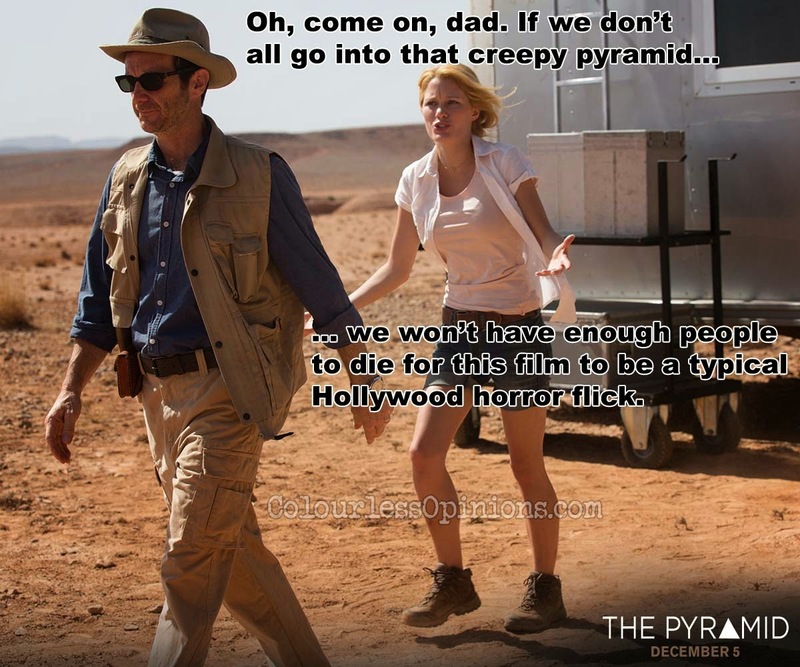 Miles Horden (Denis O’Hare) is convinced by his daughter Nora (Ashley Hinshaw) to physically enter The Pyramid together. Joining them to obviously die later are her boyfriend Michael Zahir (Amir Kamyab), and documentarians Sunni Marche (Christa Nicola) and Terrence “Fitzie” Fitzsimmons (James Buckley). Produced and directed by Alexandre Aja and Gregory Levasseur respectively, the film is blessed with the long-time collaborating duo’s desert-filming experience (from the 2006 remake of The Hills Have Eyes) who managed to create a dark creepy atmosphere in the convincingly real-looking pyramid sets crafted by production designer Marco Trentini. Sadly, however, this is the only thing that’s commendable here. The film kicks off with some text prologue to “inform” the audience that this was an actual event documented in a video, but it’s pretty much pointless as even if the film is fully found-footage, it’s not like it’d trick or help the audience into believing the movie more. Being already generic, one could only hope that they film would at least be terrifying enough, but unfortunately, there isn’t even a single decent scare. Instead of putting the great creepy surroundings and atmosphere to good use, the director chooses to go with cheap jump scares with high audio volume to frighten the audience. The deaths are not exactly that gruesome either. Quite mild, I would say. It also seems that writers Daniel Meersand and Nick Simon didn’t have the creativity and imagination to come up with a truly fearsome pyramid. Either that or the director wasn’t able to make it happen due to the lack of budget. 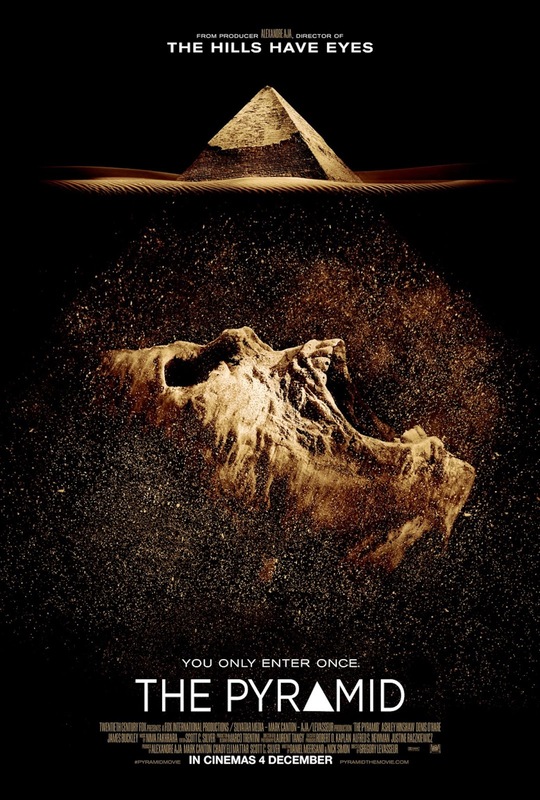 For a film that’s named The Pyramid, it’s fair for the audience to expect to see some mummies awakening and a lineup of dangerously fun traps, but disappointingly, there’s only a labyrinth, a sand-filling corridor trap, a ground of spikes, and the poorly computer-generated mythical creatures – Anubis (in the film, the Egyptian god hunts for human hearts to weigh on his scales) and flesh-eating sphinx cats. Having an Egyptian god as the horror villain is actually not a bad concept but the appearance of it here reminds me of the kiddish-looking CG of Scooby Doo in the 2002 feature film adaptation. I was horrified by how cute the antagonist looks at certain angles. The camera works of the cinematographer, Laurent Tangy, for both traditional and found-footage narratives aren’t very impressive here as it’s too dark most of the time or too close up, and in at least three occasions, it gives away who, when and in what position the next person is going to die or be attacked. But then again there are probably other factors to that, like the predictable direction, the unrealistically stupid characters, and the very poor acting. The characters here are either too calm, too forcefully afraid out of a sudden, or just too loud talking or arguing pointlessly as though they want the creatures to be able to hear where they are. The relationship between the characters are also not developed enough for the audience to care if they live or die. A couple of stuff in the story are underplayed as well, for example, the uniqueness of the pyramid being three-sided is emphasised at the beginning but it doesn’t seem to bring any significance to the plot. Then there’s also the infectious fungus that does nothing much besides changing the characters’ eye colour and gradually decaying their skins. None of these infected characters survive long enough to die or even suffer from it so what’s the point of this element in the plot? The Jurrasic Park-inspired climax would likely tickle the audience more than engaging them to the thrill of characters’ desperate attempt for survival. The ending, well, it’s just another comically cliched effort. Simply put, even a Halloween period mood wouldn’t have been able to save The Pyramid from being an utterly unworthy horror movie. Censorship in Malaysia: At the special screening held at TGV Sunway PYRAMID last Friday, nothing was noticeably chopped. There aren’t any overly gruesome sequences anyway. Second opinion: My girlfriend, who’s usually afraid of watching horror films, said that she didn’t find this one scary at all and she was actually laughing with me during certain scenes. Verdict: Disappointingly boring and cliched with frustratingly dumb characters. Perhaps even B horror movies could offer more fun than this. I’m surprised that there wasn’t a review embargo for this film.